Current lead times are 2 weeks. 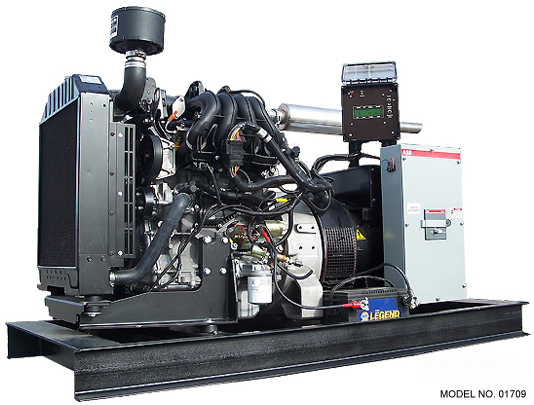 Ford 20 kW Gasoline Generator - This is the largest water-cooled gasoline generator we've seen. A one-time investment for your home or office! This smooth running, 1800 RPM water-cooled genset is ideal for applications requiring ultra-quiet operation and fuel economy. Ford MSG 425 gasoline engine w/ electronic fuel injection. A major benefit of electronic fuel injection is excellent cold starting performance. The system can calculate the optimum air/fuel mixture for starting as well as running under load. It also allows for better fuel consumption - the system constantly monitors and adjusts the air fuel ratio to maintain the optimal cold weather conditions. This monitoring of the air/fuel mixture works for high altitude compensattio too - the system is continuously calculating the ideal air/fuel mixture for your altitude. This unit features an in-line, 4-cycle Ford MSG425 2.5L 4 cylinder gasoline engine, electronic fuel injection, electronic governor (0.5% frequency control), brushless generator end, +/- 1% AC voltage regulation to protect your electronics, aluminum cylinder block, low oil and high water temperature shutdown, battery charging 12 volt alternator, heavy steel skid base and control panel w/ hour meter. Bore & Stroke 3.5" x 3.93"
Oil Capacity (w/ Oil Filter) 7 qts.